This lady is real cool. I've been wanting to write about her on my blog. I saw a drawing that she did for my friend Rick at work, who helped design her book. The drawing, which looked a lot like the one pictured here (I guess she did a lot of self portraits like this) was hanging in his house at this party he had, and I asked him about it. And he told me the story of this cool lady. 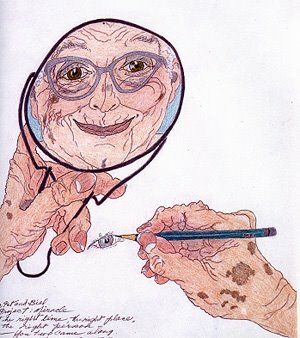 I don't remember all the details... she had an early divorce... struggled with depression... psychiatric hospital stays even... the death of a child... and what she called "40 years of depression" all changed when she took a drawing class for the first time and began drawing these contour drawings at age 68. She was taught to draw by looking at the subject, and not the paper. "I don't know why it is," she writes, "but this contour drawing has completely cured me of my forty-year depression. I simply don't have it anymore." and her work ends up in the new york art scene and galleries all over the place with art critics calling her genius and everything. I read on one website that she said: "You know, in the beginning I drew myself as someone who was ugly but I don't see myself that way anymore. Now I draw someone who is beautiful." What treasures. 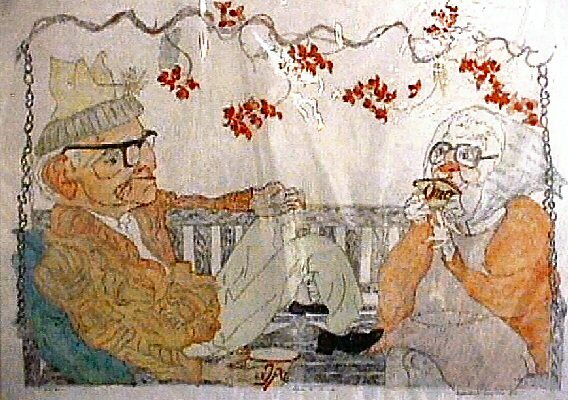 I like art with stories behind them. "All of us," said Nietzsche, "are potentially hero or genius, only inertia keeps us mediocre." i still don't understand...who took the picture of her looking at herself in the mirror? i guess it was whoever did the article about her that i was referencing. 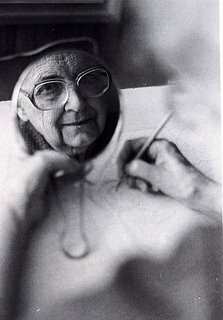 he/she took the picture of her looking at her picture in the mirror to make the picture of herself. capisce? this is kind of like cache in that we watch her looking at herself..and we don't know who's taking the picture. the hidden documentor. um. it's late, im in the office and afraid to go to my car. grandmas are pretty great...am i right??? This is crazy. If this is not the same girl from Kansas who went to Tennessee for Mountian Top, then disregard. Otherwise...I've never gotten into the blog thing, but tonight as I'm out of town in Kansas City I found myself sleeplessly looking at all the different pages of people that I don't know from eve. After actually getting into it and cycling through different groups, I came across your name, and I said to myself, "Where have I heard that name before?" Then it hit me. Or at least I think it's you.